Vanilla Overnight Oats Breakfast Bowl is an easy and delicious start to any morning. 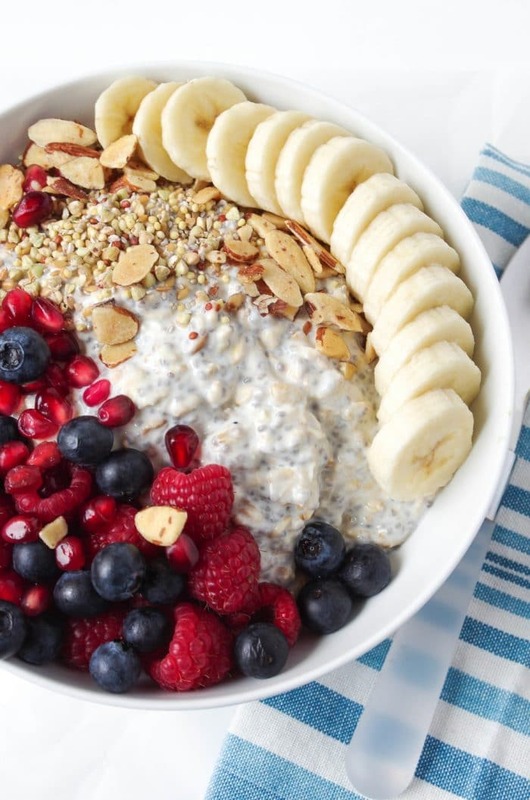 Filled with gluten-free oats, mixed fruit, nuts, seeds and yogurt, this Overnight Oats Recipe takes just minutes to prepare and is not only healthy but also delicious. I am all about oat recipes here at The Forked Spoon. Other delicious breakfast bowls include these Strawberry Yogurt Overnight Oats, Peach Overnight Oats, and Pumpkin Pie Yogurt Overnight Oats. It’s fair to say that Overnight Oats are quite possibly the best thing to happen to breakfast. At least for my family. They make me happy. They make my husband happy. And they even, somehow, make my child happy. Packed full of fiber and protein, several different Overnight Oats Recipes are on constant rotation at my house. If you’re new to Overnight Oats (it’s ok, we all have to start somewhere) let me share with you why. They’re great for kids. How do I know this? I have a child who eats about 1% of the food I make and he loves these Vanilla Overnight Oat Breakfast Bowls with Fruit. They’re also great for husbands. How do I know this? I also have a husband who eats 100% of what I cook and he has proclaimed that this is the best breakfast EVER!! Overnight Oats are super easy to clean up. No milk or cereal spills and definitely no tiny toast crumbs. You can make Overnight Oats in practically every single flavor known to man. 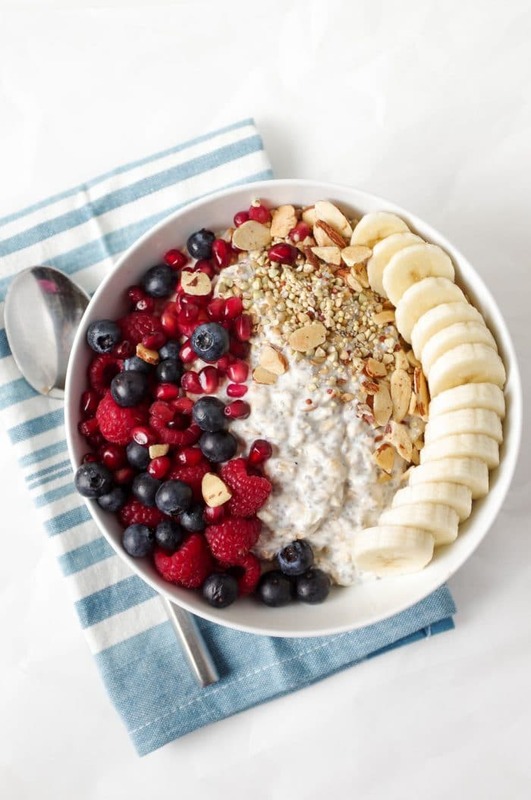 You can MEAL PREP overnight oats– including these Vanilla Overnight Oat Breakfast Bowls with Fruit- for the whole week…for the whole family! In other words, the ingredients are super simple. But do you know what is even simpler? Actually making it. All you need to do is place the ingredients in a jar, mix really well, refrigerate for at least 4 hours and BAM! That’s it. 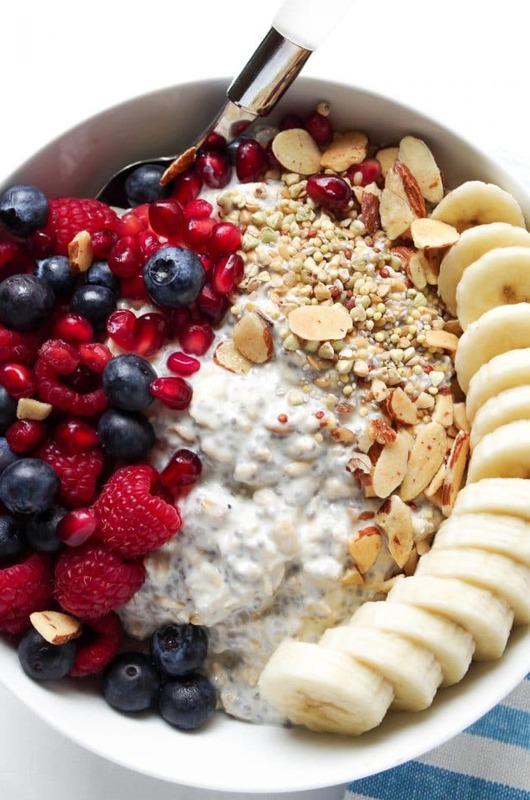 Your very own Breakfast Bowl (minus the fruit) is ready. But what about all those fancy toppings? Fruit. fresh or frozen. I had raspberries, pomegranates, blueberries, and banana, so that’s what you see. Nuts. sliced almonds are my fav. Seeds. Trader Joe’s has a great nut and seed blend that basically takes the guesswork out of overnight oats. Other stuff- honey, peanut butter, coconut chips, cocoa nibs, GO WILD! Anyway, as I mentioned, bowls of oats are actually my husband’s favorite breakfast food. He asks for it all the time, but I always forget to make it until the next morning. 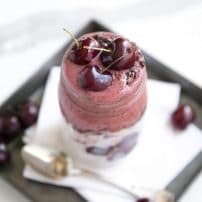 Super healthy and SUPER easy to make, overnight oats are the perfect breakfast to have ready and waiting for the fam when I feel too crummy to even think about breakfast in the morning. It’s also a great grab-n-go breakfast jar (although I do not recommend eating and driving). Be sure to add enough liquid. Whether you drink dairy milk, non-dairy milk, or something entirely different, the ratio should be somewhere around 2:1. In other words, for every 1 cup oats, you should add 2 cups liquid. Unless you’re also adding yogurt (as I did here). If you decide to add yogurt, you can reduce the total amount of liquid by one quarter to one half. Speaking of yogurt- highly recommended. Yogurt is creamy and full of added protein. It’s like a win-win everywhere. Watch the added sugars. It’s easy to turn this healthy breakfast into diabetes loaded sugar bowl if you’re not careful. How? Vanilla flavored milk, plus vanilla flavored yogurt, plus honey, plus fruit. It’s too much. My recommendation would be to pick one plus the fruit. Be sure to use the right kind of oats. Rolled oats are what you’re after when it comes to overnight oats. Steel-cut oats are best when cooked. Be sure to add the chia seeds with the oats and allow them time to absorb the liquid goodness, too. As for the other toppings, many are better off being added later-such as fruit and nuts. Always mix well before eating. Play with the flavors, toppings, liquid to oat ratios, and have fun! 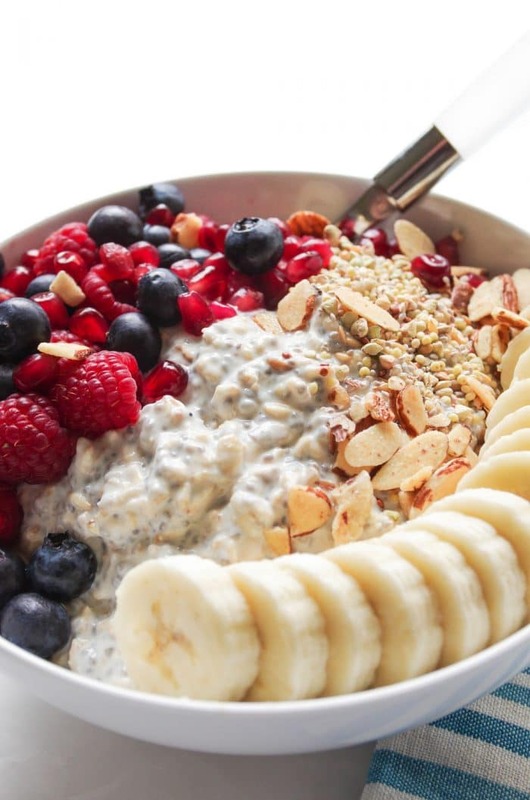 Don’t forget to check out these other Overnight Oats Recipes! 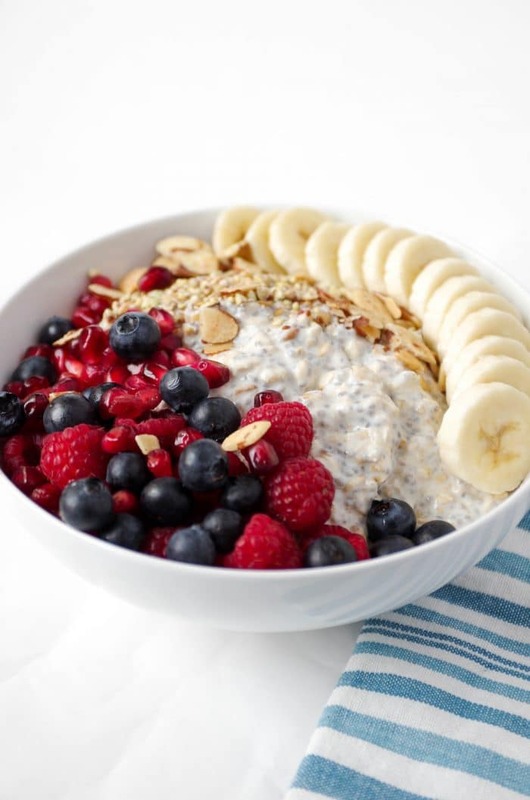 The best way to start any morning is with a bowl of Vanilla Overnight Oats with Fruit. 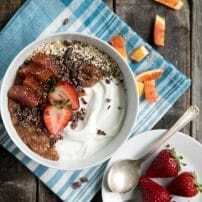 Filled with gluten-free oats, mixed fruit, nuts, seeds and yogurt, these bowls of Overnight Oats with Yogurt are not only healthy but also delicious. In a large mason jar or container with a secure lid, combine the oats, yogurt, milk, chia seeds and vanilla extract. Mix well. Cover with an airtight lid and store in the refrigerator for at least 4 hours to overnight. So is this recipe for 2 people I guess each serving is half a cup of oats??? Yes – each serving is a half of cup of oats. I am always looking for new recipes for delicious overnight oats. So I just landed on your great blog. Right tonight I will test your recipes! Can I also do the oats for 2-3 days in advance or do you think it is better to prepare them fresh every evening? Your English is great! Yes, you can do the oats 2 -3 days in advance, as that is what I regularly do. I have always used the old fashioned rolled oats; however, I do not see why steel cut wouldn’t work. Mine lasted a few days, and was still good. I think the trick is making sure the fruit still has plenty of life left at refrigerator temperature. I made this recipe last week and it was amazing – it was a big hit with the whole family! Hahaha! I can so relate to toddler bedtime! I made this last night with the intention of having a quick and day breakfast but it didn’t work out that way. We ate it for dessert!. I’m not an oatmeal fan but have been trying to find ways to make it easier to swallow and after many failed attempts I have finally found the perfect recipe. Thank you so much for sharing this. It’s not only good for you but also delish!